One of my vivid early memories of going to the cinema is going to the Oxford in Whitstable, with my younger brothers in tow, to see a reissue of Cecil B. De Mille’s The Ten Commandments, first made in 1956 but still doing the rounds in the late 1960s. We came out exhilarated, overwhelmed by the experience. Later generations, not brought up on Bible stories in the way that we were possibily cannot imagine the visceral thrill felt at seeing those so familiar narratives brought to thunderous big screen life. In those days, Moses, Aaron, Joseph, Cain, Samson et al were part of your DNA. You knew their every story, every twist and turn of the Biblical narratives that mythologised them. Seeing them brought to vulgar cinematic life (not insipid televisual life) thrilled you to the core. It’s worth remembering such sensations when considering the earliest Biblical films, because undoubtedly they stirred their original audiences in much the same way. Look! the Red Sea is parting! Look! the star of Bethlehem is moving! They may or may not have confirmed faith, but they undoubtedly carried with them the thrill of the realisation of what had been imagined. A fine selection of such films were on show last night at the Bloomsbury Theatre in London. 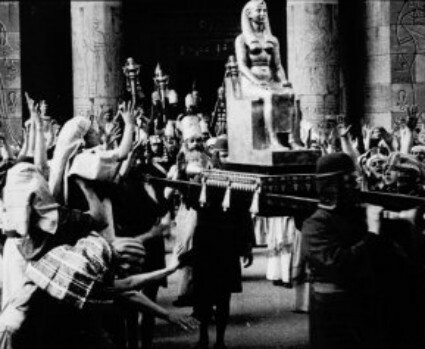 The Ancient World in Silent Cinema 2 was an afternoon and an evening (22 June) of early films set in Biblical or Near Eastern Antiquity, and followed on from January’s screenings of films depicting Ancient Greece and Rome (previously reported on by the Bioscope). Exhibited as part of a project on the Ancient World and silent cinema being developed by University College London Department of Greek & Latin, the films were accompanied by the excellent Stephen Horne, on piano, electonic keyboard and flute (not quite managing three at the same time but managing all the combinations of two), with interval talks given by David Mayer and Judith Buchanan. As in January, there was a good audience, many of them clearly from disciplines other than film studies. I’m always apprehensive where early films are put before a new audience. What will they think of this peculiar world where people roll their eyes and throw up their hands, where men start back in paroxysms of love the instant they set eyes on a woman’s face, where titles announce the action before it has taken place, where painted cloths must serve for epic scenery, where people crowd the frame so much you can lose sight of the leading players, where people creep up close to overhear conversations and yet remain unseen, where colour is hand-painted, where miracles are magic tricks and angels float on cardboard clouds? Will they laugh because they are insensitive, or because they see these films for what they are that much more clearly than I am able to? Well, there were some sniggers, but not many. This is the great advantage of showing a programme of such films, on a big screen, live music, and enough (but not too much) contextualisation. The audience saw what the films were about, could see where there was good, were touched by moments of artistry, were even – at times – moved. The films are their own best defence. The films were presented in roughly chronological order. We began, a little oddly, with a British knockabout comedy, Wanted – A Mummy (1910), in which a man dresses up as an Egyptian mummy to fool a professor. La Sposa del Nilo (1911) was a proto-epic, where you could sense the Italian filmmakers (Enrico Guazzoni in this case) gearing up to the gigantic imaginings of Cabiria and Quo Vadis just a few years on. The film wanted to impress you with its stateliness and scale; at time the central action (a young virgin is drowned to appease Isis and ensure that the Nile floods) became lost in the crowded frame – but that just reminded you that early cinema audiences look that much more intently at what was going on, and picked up on details that our lazier eyes sometimes miss. La Vergine di Babilonia (1910) gave us the tale of Esther (partially based on the Biblical Esther, with a touch of the Book of Daniel as well), who brings about the overthrow of the King of Babylon when he throws her into a den of lions only for the lions to leave her alone, causing the populace to rise up against him. Amid the characteristic histronics were some well-composed shots to linger in the memory, especially one of Esther walking down some steps in her triumph, framed by the outstretched hands of the grateful people. Caïn et Abel (1911) – interesting thinking behind the chronology there – impressed especially with a Cain haunted by the crime of killing his brother being hunted down by an avenging angel across a rocky landscape, reduced in his shame to a crawling beast. 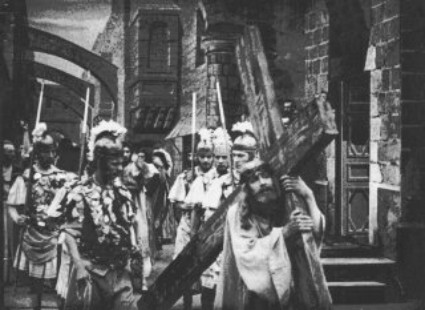 La Sacra Bibbia (1920) was the only post-WWI film on show. We were given the episode of Joseph intepreting the dreams of Pharoah, part of an Italian epic which tried to recover the glories of pre-war days but instead showed how Italian cinema collapsed so grievously post-war, unable to move on imaginatively, hampered financially. Moïse sauvé des eaux (1910) and L’Exode (1910) presented two episodes from the life of Moses. The first was average; the second, though ponderous in pace, showed real directorial imagination – the first of three films we saw made by Louis Feuillade. Here was someone who knew how to compose and fill out the frame. We even had an instance of Rembrandt lighting (a scene lit from a high window), and at one point a panning shot which covered three phases of action. However, you wondered where your sympathies should lie. The Egyptians had a hard time of it, as they wept over the death of the first born, while the smug Israelites marched out of the city. Without the homilies that might accompany them, the films sometimes had quite different messages, or sometimes no messages at all. Pressing business forced me to miss La vie de Moïse (FR 1910) interspersed with Life of Moses (US 1909-10) – with a pre-De Mille parting of the Red Sea – and two American versions of Jephthah’s Daughter. For the evening show some films had been cut, as they’d discovered that the running times they’d been working to were for the films at sound speed, whereas we were seeing everything at exemplary silent speed. So things kicked off again with Samson et Dalila (1902), an early Pathé effort where there was no semblance of plot or build-up; instead we launched straight into Deliah cutting Samsons’s hair, then Samson pulling a huge millstone, then Samson bringing down the pillars of the temple and rising up in triumph, accompanied by angels. Film as pure sensation. La Reine de Saba (1910), directed by Henri Andréani (who also gave us Caïn et Abel and Moïse sauvé des eaux) had almost no plot at all, at least none worth worrying over. Spectacle was all; sometimes cramped spectacle, as the director brought as many people as he could ino the frame, but the composition was excellent, with just as much attention given to the positioning of spear-carrier at the back as to the royal lovers centre stage. The film also boasted a startling procession with long camel train clearly located in North Africa, one of the camels bearing the canopied panier of the Queen of Sheba. A lot of effort and money went into making this film, evidence of how important historical and Biblical dramas were to the early cinema. Giuditta e Oloferne (1908) was Italian in origin but French in style. It looked like director Mario Caserini was imitating the Pathé of pure sensation, in this case the story of Judith and Holophernes, favoured by the early filmmakers because she ends up cutting off the Assyrian king’s head. So the film was followed by Louis Feuillade’s intepetation of the story, Judith (1909), once again showing a fine sense of composition. Then followed one of my favourite early films – one I’d not seen in twenty years, so it was a particular pleasure to see that it was as good as I remembered it, and that the audience were similarly impressed. In Feuillade’s L’Aveugle de Jérusalem (1909), or The Blind Man of Jerusalem, a blind man is unaware that his daughter is visited by her lover and that his servants are robbing him. He witnesses Christ performing miracles in the street and has his sight cured. Pretending still to be blind, he is horrified to discover how he is being cheated. But the sight of Christ bearing his cross, forgiving his enemies, leads the man to forgive likewise. It is told through mise-en-scène of great simplicity – only two set-ups are used, the interior of the man’s house, and the street outside, each featured twice in alternation. The parable could be Biblical, but it is pure invention – a bold coup in itself. The BFI’s print (all of the films came from the BFI National Archive) has replacement titles which may reproduce the original text or may have been written later (interest from religious bodies saw that a number of these early films were shown into the 1920s and 30s); at any rate, they are in keeping with the film’s moral but modest tone. In its unassuming way, L’Aveugle de Jérusalem is the perfect film. We finished with Vie de Jésus (1905-1914, aka La Vie et la passion de Jésus Christ). Multi-scene nativities and lives of Christ were among some of the most popular of early films; so popular that they were frequently re-made. 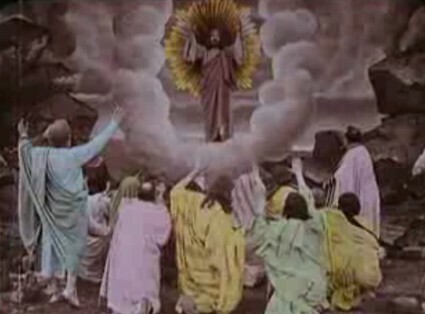 Pathé produced at least four such series, from 1896 to 1914, the New Testament narrative being broken down into tableaux which could be ordered scene-by-hand-coloured-scene according to budget, taste, or particular Christian persuasion (for example, the scene where St Veronica places a cloth over Christ’s face and receives an impression of his face on the cloth was popular with Catholic audiences but was not usually shown to Protestant audiences). This was the Bible as pure pictorialism, pure signification. The tableaux provided a checklist of necessary images – beasts in the stable? check; Judas’ kiss? check; soldiers gambling at the foot of the cross? check. And so on. Of course, anyone looking at these films without any knowledge of the Bible would be baffled; in narrative terms the series is quite incoherent. But they weren’t meant for such an audience; they were meant for an audience who knew exactly what to expect, and what lessons might be drawn. The build-up to the Crucifixion duly impressed the 2009 audience with its sober power, and just when we thought an element of ludicrousness might have been introduced with the Ascension, Christ did not rise up in the air vertically, but instead retreated backwards as well as upwards towards angels amid the clouds, a visual coup that caught us all by surprise. They knew a thing or two, the early filmmakers. We are now also planning the next stage of the project, after the two film screenings in January and June 2009. It will involve the investigation in detail of a broad range of silent films set in antiquity leading to the production of a special issue on The Ancient World in Silent Cinema. We are also in consultation with archivists, librarians, scholars, and festival curators in the UK and abroad to extend the project into an international network of experts, leading to an online database, conferences and publications and, perhaps most importantly, preservation, digitization, and exhibition. If you would like to inquire further about the research project or about these events, please contact Maria Wyke (m.wyke [at] ucl.ac.uk). Finally, Maria Wyke has produced a podcast on the representation of the ancient world in silent films. Hi, I like your blog and I have thought about put a link in mine, you can go and read it. I was at the showings on Monday and you didn’t actually miss the two Jepthah films, or rather, we all did: these two films also couldn’t be shown because of the overrun. It was a very impressive event – which made me doubly sorry that I hadn’t known about the earlier showing in January. Sounds wonderful, as did the previous screenings…..as they were all BFI prints, dare we hope for a ‘Silent Bible’ DVD set as a comapanion to the Silent Shakespeare and Silent Dickens sets ??? Especially as there seems to be a lot of academic work focussing on these films…. I rather like the idea of a Silent Bible set. It would be interesting to see how they packaged it. And an Ancient Greece and an Ancient Rome set. Well, let’s see what clout the UCL project has if it grows as they hope – preservation, digitisation and exhibition are all among their ambitions. What the Bloomsbury event brought home to me was how valuable it is to present such films to new, interested audiences away from the film studies cul-de-sac. There must be more such shows. Thanks for the write up. It was a great day wasn’t it? The lighting in L’exode was stunning. A couple of things to add. Firstly you might be interested to know that the final film (Vie de Jesus) was renamed a some point “The Life and Passion of Jesus Christ” and is available on DVD along with “From the manger to the Cross” (1912). You can get it from AMazon (although it comes from the US: It says it’s region 1, though the DVD I got about 6 years ago is region 0). Secondly, the Esther film was not actually about the biblical story of Esther, although it is clearly influenced by it and the story of Daniel in the Lions’ Den. I’ve written some comments on the day on my (Bible Films) Blog – http://biblefilms.blogspot.com/2009/06/ancient-world-in-silent-cinema-report.html (not sure if the URL will post but still…) – and am in the process of writing up the silent Bible films one by one. Vie de Jesus – or as I think it should be, La vie et la passion de Jésus Christ – is indeed available from Kino on its DVD of From the Manger to the Cross, under its English language title. It’s important to note that the ‘film’ was an ever-changing entity. The company, Pathé, kept on remaking bits of it, and customers could order different sections according to purse and taste. Thanks for the correction re Esther. Back to the bottom of the Bible class I go. I’ll make a correction to the post. And your own blog post is very interesting, not least for your impressions of silent film presentation in general. I look forward to your comments on the individual films. : different sections according to purse and taste. Yes, I think someone mentioned that on the day which was one of those moments when everything slotted into place. I have a number of different DVD versions of this material and had been trying to work out the story behind it all, and now it all makes sense.